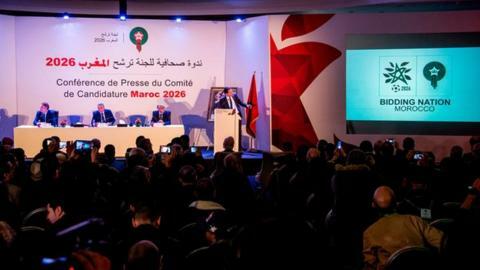 "Morocco 2026 will showcase the best of football, at the heart of the world," bid chairman Moulay Hafid Elalamy said at Tuesday's launch. The decision on who will host the event will be made on 13 June, the eve of the 2018 World Cup in Moscow. "We promise to stage a tournament overflowing with real passion and to celebrate the values of unity and peace," added Elalamy. "A World Cup in Morocco will deliver commercial success and leave a long-lasting legacy and if we win the honour of hosting we believe the winners will be football, the young people of our nation, Africa and the world." No details were given about the host cities, with the vote to determine the host less than five months away. The North African nation has failed in four previous World Cup bids - in 1994, 1998, 2006 and 2010. In 2010, the tournament was hosted by South Africa as the continent staged the World Cup for first - and so far only - time in its history. Morocco is looking to change all that and has appointed Elalamy, a government minister, to lead the bid while former Confederation of African Football Secretary General Hicham El Amrani will be its chief executive. Fouzi Lekjaa, the head of Morocco's Football Federation (FRMF), said at Tuesday's launch: "This is an important moment as we begin to showcase our bid to Morocco, the international community and Fifa's National Associations. "We have assembled a committed, experienced team to bring our vision to life." Rachid Talbi El Alami, Morocco's minister of youth and sports, said that the country's infrastructure is more ready than at any time to host an expanded World Cup, with 48 teams set to play in the 2026 finals. "Morocco has made rapid progress since 2003 - in sport, infrastructure, hotels, airports, motorways and public transport networks," said Talbi El Alami.